On Thursday it is time for THE danish coffee event again. In Århus. 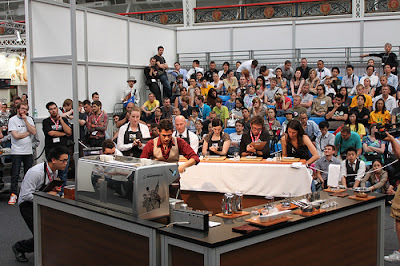 Everyone involved in specialty coffee gathers once a year to make a show where you can come in to see, try and discuss coffee. There will be many things happening that will be fun to follow- it is an open show where everyone can find something interesting. It doesn't even matter if you drink coffee in the first place. There will be places where you can try coffee and watch competitions gathering the leading coffee people in Denmark. This event is the Bocuse d'Or of coffee in Denmark. Those who do good here will represent Denmark in the international competitions this summer. We wish everybody good luck in their aspirations and of course especially our competing collegues. You can read more about Dansk Kaffe Show if you click on DKS or SCAE. See you in Århus ! Hvor kan man se resultaterne fra Dansk Kaffe Show 2011? ?